We have passed this restaurant several times, before deciding to push on to Brixton Village. It seems that others have also passed by as we can see no other reviews online. 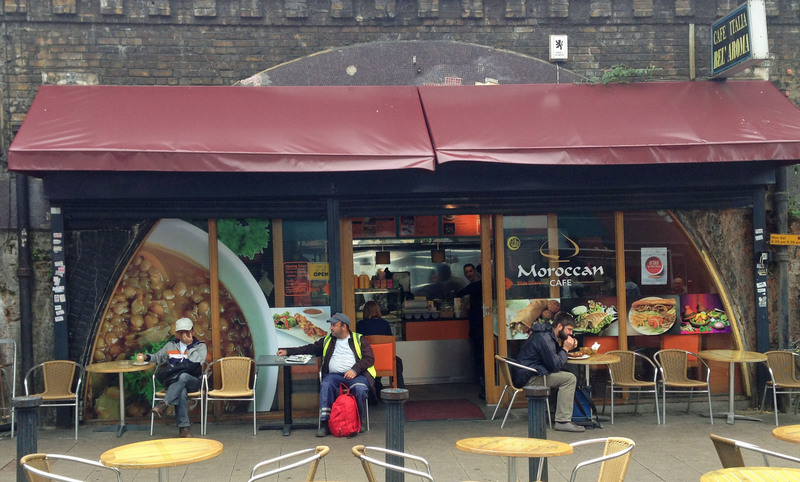 Passing by is easy as distinguishing this restaurant from the other cafes on Brixton Station Road is really difficult. But we had heard some good reports and were on a mission to get couscous, which is reputed to be on the menu for Friday. They start late so we arrived about 2.00pm to see some large pots on the stove with steam and nice smells. This restaurant is on the right hand side of the road opposite the San Marino and has the name of the restaurant on the windows. On non-rainy days it has silver tables and chairs out in front. The inside is tiny with a single row of tables and chairs, a bar where you order and an interesting wall at one end. This wall is just a picture of a house or mosque in Fez or Essaouira. There are two doors inserted into the picture and one says toilet. They serve a variety of sandwiches made up to your exact requirements and while we were eating we heard some pretty demanding customers who were all served with a smile. There is a menu – things available all the time and the daily specials. Tajines, Paella, Couscous and something called Lamb Tripe (for those who want to try it is supposed to be on Sunday). However, the menu should be considered as a general guide to what might be there. 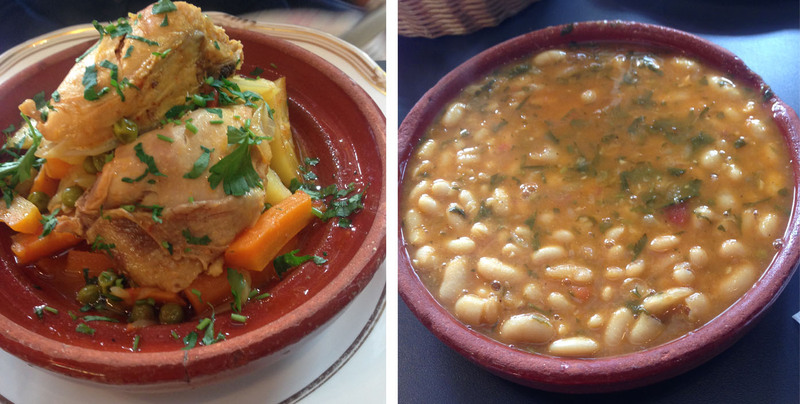 Couscous, which was our main reason for the visit, was unavailable this Friday, so we made do with the Tuesday special – chicken tajine and a bean soup. The bean soup was subtle but I noticed that my partner didn’t add salt which he nearly always does. My chicken tajine was not exactly like any tajine I have had before. Most of those had come from Andalucia and they usually have some fruit in them like apricots. Tajines are the dish that the food is made in with the odd curved top so all the condensation from the cooking liquid slips back into the pot to give a soft stew like texture – and that is what mine had. Lots of chicken, carrots and potatoes again with a subtle flavour. It’s definitely comfort food. It is all very busy despite the limited space with people coming and going with carrier bags and depositing them behind the counter followed by people preparing food and making up sandwiches or providing a delivery of cakes. But the chef is also pretty demanding. While we were waiting to order at the counter we heard him tell someone in the front of the queue that he wasn’t happy with the soup and would they like something else. Honesty is definitely the best policy and it just made us all feel like we were getting the best food he could make. The guys over the counter also seem to provide a translation service. One young woman had received a letter from a family she got to know in Morocco but couldn’t understand their letters. They were happy to provide an overview of the letter while she sipped mint tea. 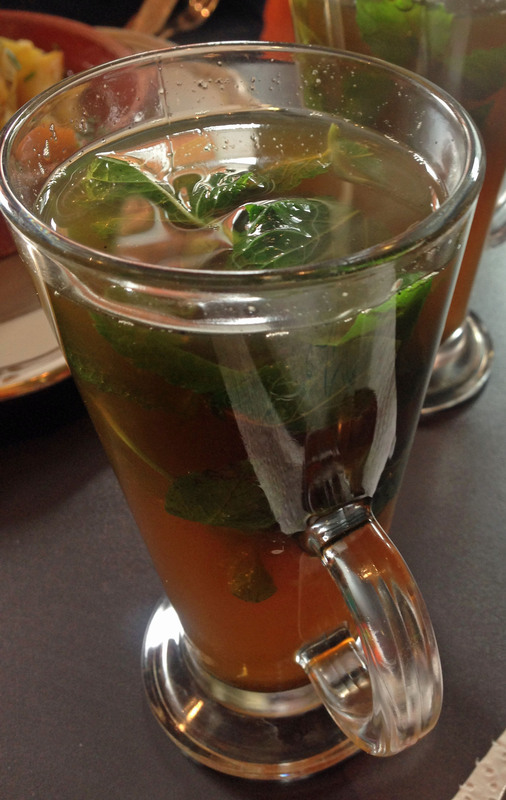 We also had steaming cups of mint tea which was very, very, very sweet but we got used to it and in the end decided that it was the dessert. It also seemed to get mintier the more you drank. The bill for the two of us came to £12.00 …. a definite stop off for friendly slow paced service with a surprise … what will be on the menu next time and maybe we will even try the Lamb Tripe someday. I used to go past this when the temporary ice-rink was in Brixton, and always thought it looked lovely – sadly, I was never passing at lunch-time! Might have to make an effort to be in Brixton at lunchtime sometime soon.